This Olive Garden Copycat Alfredo sauce requires NO COOKING! Whipped to a mousse-likeconsistency and made with real parmesan cheese. This version came out just the way I anticipated, after bringing home their buy one take one Alfredo dish. 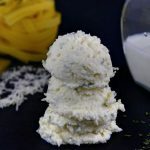 I started searching for a way to replicate Olive Gardens version of the Buy One Take One Alfredo Sauce; after analyzing that theirs looked like a whipped scoop of mouse that melted to a sauce. I came to realize that if you beat heavy cream long enough you get butter. This isn’t butter! I beat my cream for only a certain amount of time with a stand mixer, adding the remaining ingredients and came to the consistency of a thick mouse that’s seasoned and ready for use. This makes a great make-ahead sauce especially for bigger crowds as you can prep the pasta and melt the “Alfredo mousse” right before serving. With only 4 ingredients you can achieve a sauce that didn’t even require a pot! Also, check out my easy One-Pot Alfredo Recipe! 1. Beat heavy cream for 3-4 minutes over high speed until stiff. Add the parmesan cheese, garlic salt, and parsley and beat for 1 more minute. 2. Refrigerate or freeze until ready to serve. 3. To serve, scoop whipped alfredo with 1 lb of warm cooked fettuccine noodles or heat through separately and toss with ready to eat noodles. This Olive Garden Copycat Alfredo sauce requires NO COOKING! Whipped to a mousse-like consistency and made with real parmesan cheese. This version came out just the way I anticipated, after bringing home their buy one take one Alfredo dish. Beat heavy cream for 3-4 minutes over high speed until stiff. Add the parmesan cheese, garlic salt, and parsley and beat for 1 more minute. To serve, scoop whipped alfredo with 1 lb of warm cooked fettuccine noodles or heat through separately and toss with ready to eat noodles.